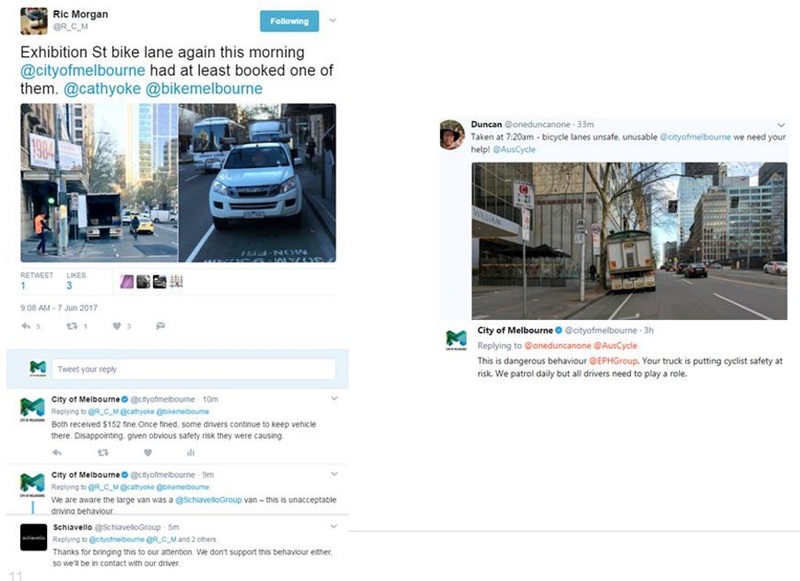 In May 2017, the City of Melbourne was receiving almost daily complaints on social media from cyclists about cars parking in bike lanes. Drivers were persistently disregarding the ‘No Stopping’ parking signs during peak hours and parking in the bike lanes, typically to drop off passengers for less than a minute. This created a safety risk for cyclists, who must leave the painted bike lane and merge into the traffic lane to pass. With 36.2km2 to patrol, the City of Melbourne didn’t have enough parking officers rostered on during the early morning peak to adequately monitor bike lanes, school crossing areas, regular parking bays and other problematic areas. This meant the bike lanes were only monitored intermittently while a range of patrol areas were juggled. The City of Melbourne has a ‘voluntary compliance’ policy where parking officers will provide drivers who are present with their illegally parked vehicle an opportunity to move it before issuing a fine. As drivers are typically present with their car when parking in a bike lane (because they’re dropping off passengers), they were being waved on by officers without receiving a parking fine and having to learn the lesson ‘the hard way’. City of Melbourne was hearing loud and clear on social media that our approach to managing this issue was not working for the thousands of cyclists who commute to work each day. 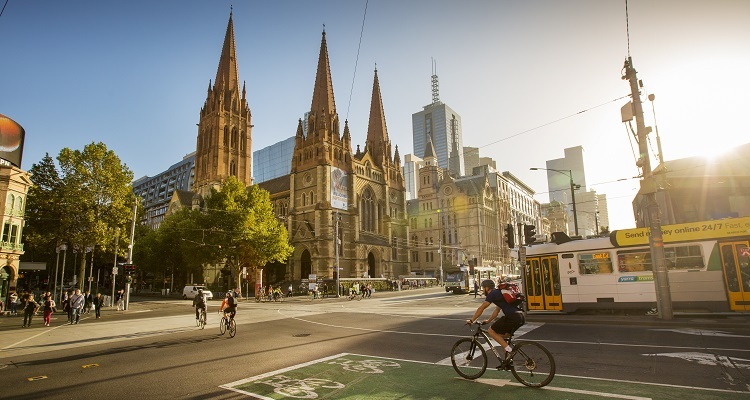 Broadly speaking, the benefits of cycling are well documented and the City of Melbourne is committed to boosting cycling participation via our Transport Strategy and Council goals (specifically council goal #2 “A city for people” and council goal #6 “A connected city”). When people choose to ride they reduce emissions, noise, congestion and free up public transport capacity. Cycling also provides mental and physical health benefits and can be great fun. But City of Melbourne’s own research showed that concern for safety remains the primary barrier preventing more people from cycling in Melbourne. While an absence of physically separated bike lanes remains the biggest hurdle, the research showed that blocked bike lanes due to construction activity or illegally parked vehicles also make cycling a less attractive option. Other major cities around the world are facing similar challenges. Melbourne is facing substantial population growth over the next 30 years including. With the daily population in the city forecast to increase from 911,000 today to 1.4 million by 2036, and bold changes are needed to the way we share space, roads and transport to ensure our city remains the most liveable city in the world. With senior managers on board, City of Melbourne ‘shifted gears’ and began using social media to engage with drivers and cyclists in a new way. The target audiences for the campaign were drivers, current cyclists and prospective cyclists. Encouraging more people to make the switch to cycling, knowing that the City of Melbourne is looking after their safety. A 14-month campaign began in June 2017 and was wide-ranging and multi-faceted but focused heavily on social media. This is because the Melbourne cycling community is very active on social media (particularly on Twitter) and City of Melbourne wanted to tap into that established community to reach one of the target audiences. 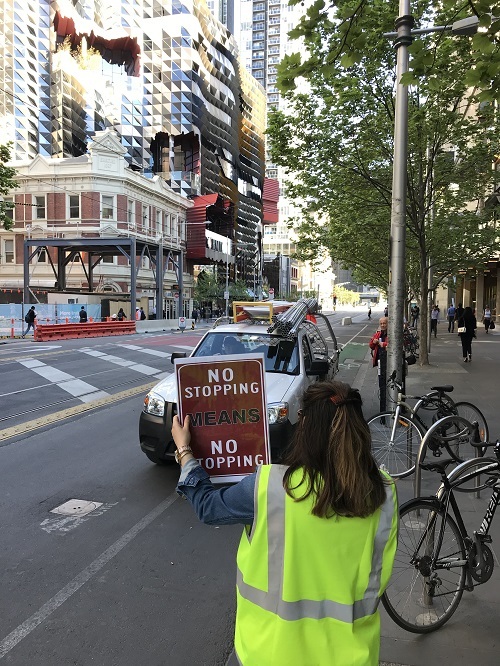 Did some on-street activation for Ride2Work Day in October 2017, with roaming teams of City of Melbourne staff members cheering on cyclists and moving parked vehicles out of bike lanes. In the first two months of the campaign, we noticed that many offending vehicles had company branding, and many of these companies were active on social media. City of Melbourne tweaked the communications and marketing plan to experiment with naming and shaming offending companies, to help them understand the serious safety ramifications of their drivers’ parking behaviour. This included publicly tagging offending companies in social media posts to encourage them to take accountability for their parking decisions. This was a bold approach – not something that traditionally conservative local governments are usually willing to do on social media. No companies were spared – taxi companies were tagged, a major news company, a major logistics company, a moving company, construction companies, an equipment hire company and a cash management company, to name a few. 1. Companies began replying and agreeing with the posts, promising to address their driver behaviour. 2. Cyclists took the lead and started naming and shaming companies for us. For the first time, companies starting to take accountability for their drivers’ actions. To amplify the reach of our messaging, City of Melbourne utilised the Lord Mayor of Melbourne’s regular radio segment on 3AW radio with Neil Mitchell to publicise the new approach. The then-Lord Mayor promoted the campaign on air, explaining the safety risk to vulnerable cyclists and promising to name and shame those who park illegally in the bike lane. As expected, the story was then picked up by major news outlets and a media statement and parking statistics were prepared and ready for the resulting media coverage. The results of this campaign far outweighed the expectations. Bike lane complaints have reduced dramatically (approximately one per fortnight, compared to daily before campaign). Regular offenders in the most problematic street (Exhibition Street) have changed their parking behaviour, and are now selecting legal parking to drop off passengers in peak hours. This was no doubt influenced by the 1300 parking fines we issued to drivers in Exhibition Street in FY 2017/18. Parking fines are the most effective method of behaviour change. 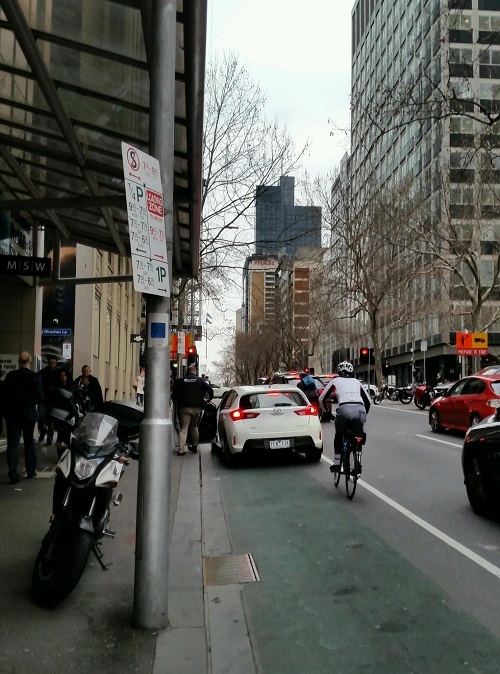 City of Melbourne increased engagement with current cyclists, responding to 60 social media posts and proactively posting 11 times about the bike lane enforcement. -Proactive tweets had between 17.9k and 48.6k impressions each, up to 401 likes each and up to 50 retweets. -Replies to cyclists’ tweets had between 221 and 741 impressions each. Cycling numbers in the morning peak hours are slowly increasing: there were 12,023 cyclists in the March 2018 count, compared with 11,496 in March 2016. While this is only a small increase of 4.38%, it’s a step in the right direction and is expected to continue increasing. Gaining recognition from industry stakeholders – particularly Bicycle Network, which is a very active advocate for cycling in Victoria. It regularly retweeted our posts to its 12.2k followers, which helped reach a broader audience. Companies starting to take accountability for their drivers’ parking decisions by replying to City of Melbourne tweets, agreeing that their parking choices were unacceptable. Cyclists started tagging offending companies on social media, meaning that the baton has been passed onto cyclists to continue focusing on patrolling the bike lanes and creating proactive cycling content for social media and other channels. The campaign has become an internally celebrated example of an effective way to engage with the community on key issues close to their heart. The campaign’s success means it has been incorporated into City of Melbourne’s ‘business as usual’ approach to social media and parking enforcement. Given the low cost of this campaign (and the fact that most local governments are active on social media), it could be easily replicated by other local governments Australia-wide to proactively tackle a wide range of issues. Don’t be scared of publicly engaging with an angry segment of your community. Creating conversation can break down barriers, improve your standing in the community and allow the public to feel heard and play an active role in solving the problem. The discussions underneath each social media post were self-moderating. Twitter and Instagram proved to be a more productive channel for this type of messaging than Facebook. This was most likely due to Melbourne’s cycling community being very active on Twitter, but we also found discussions on Facebook to be less productive, and contributors to be quite ‘driver v cyclist’ in their mentality. If you plan your approach carefully and strategically, you can reach a very wide audience using very little budget, especially if you support your communications with visible changes in your business (e.g. patrolling strategy). But consistency is key – cyclists need to see you out there patrolling the bike lanes every single day. After comprehensive planning, it’s okay to tweak and refine your marketing and communications tactics as you go. Being flexible and open to a new direction, when the opportunity presented itself, allowed us to try a bold new approach. Allowing many staff members to be involved in the campaign piques their interest and drives their engagement. We found involving parking officers (a group of employees who are not typically involved in marketing and communications) in the campaign by asking them to take photographs that could be used in proactive posts, was very worthwhile. City of Melbourne won the Outstanding Marketing and Communications award at the 2018 Parking Industry Awards.